It was a pretty short wait this time around. Rowling, my latest WordPress theme, is now available as a free download from WordPress.org. 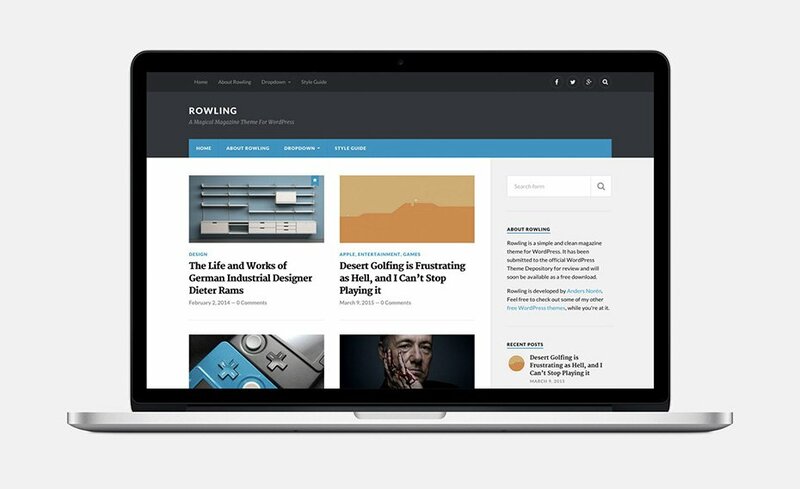 Rowling is a clean and simple theme built with magazines in mind. The archive pages lists posts in two columns, which gives ample room for your content. The single posts feature a big featured thumbnail, great typography and a built-in section for related posts, so that your visitors always have something more to read. The widget area in the sidebar (which becomes the footer on smaller devices) and the support for a custom accent color and a custom logo gives you plenty of opportunity to put a personal touch on it. As my other themes, Rowling is also completely responsive and offers a great reading experience on both tablets and smartphones. I have another theme in the works – a simple one this time – but between my internship at Plakat, my impending graduation from Umeå University and life in general, it’ll probably be a while before it sees the light of day.